From petite pins and sparkling combs to heirloom-worthy tiaras, our collection takes influence from vintage hair accessories from the Roaring Twenties to the Fabulous 1950s. 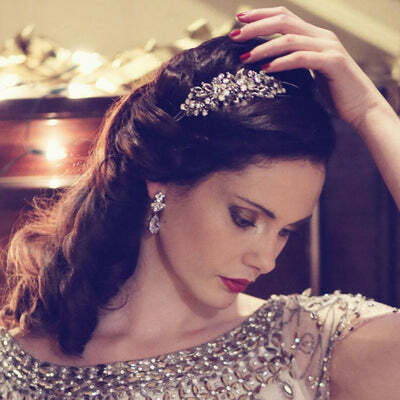 Any vintage-lover will adore our range of side tiaras, all of which sample from the greatest fashions of the past decades. Bold and eye-catching, each of these uniquely designed hair clips takes inspiration from eras gone by to create a fabulous look for the modern day. Our range of hair slides is perfect for adding a subtle touch of glamour to any look. We have a range of colours and styles available. Whether you scatter a couple or create your own bold design, the hair pins in our collection add a touch of vintage sparkle to any hair style. There is nothing as striking as a glamourous head piece and ours hark back to the legendary looks of the 1920s through to the 1950s. Revolutionary in their conception, our hair bands reflect the dramatic jewellery statements from way back in the Roaring Twenties. Perfect for creating a dramatic hair style, show off your vintage fashion sense with our range of stunning hair combs. Whether you’re looking for a delicate tiara worthy of royalty, or a bold Art Deco design to make an impact, you’re sure to find the perfect tiara in our collection. The perfect hair accessory to add a touch of antique style, our collection of head bands takes inspiration from mid-century icons to transform you into a modern-day Starlet.